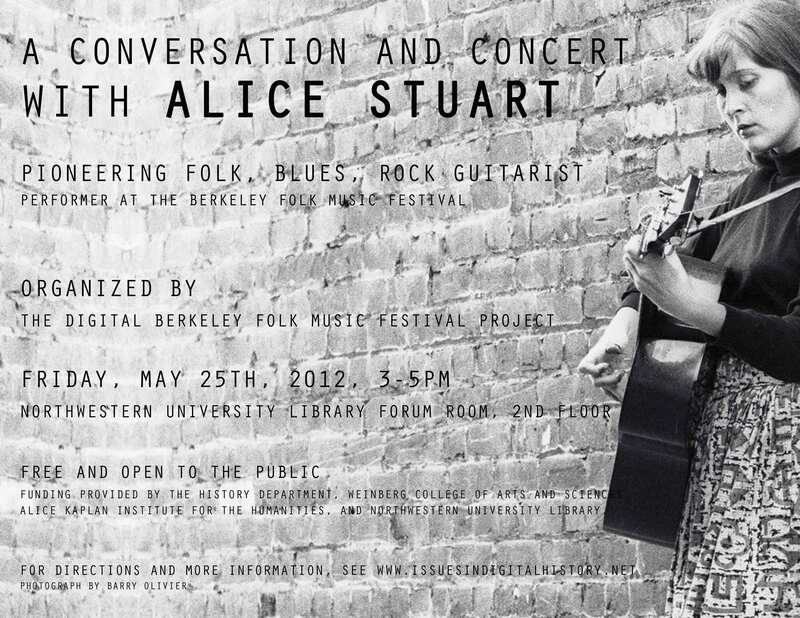 Alice Stuart in Conversation and Concert, 25 May 2012, Berkeley Folk Music Festival Project @ Northwestern University. We are delighted to have Alice Stuart visiting The Digital Berkeley Folk Music Festival Project @ Northwestern University. 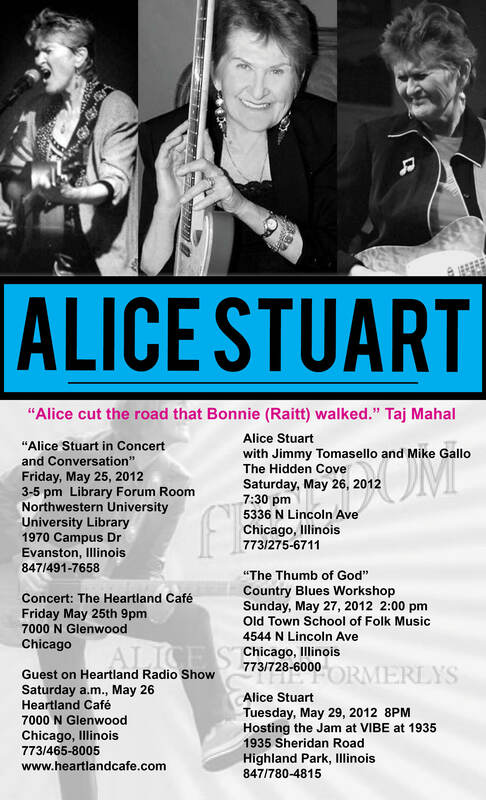 Alice will be visiting with my seminar students in Digitizing Folk Music History, spending some time in the actual physical archive, recording an oral history interview, and performing both at Northwestern and around the Chicago area. She is one of the foremothers of sixties rock. Alice wrote her own music, fronted a male band, and played lead guitar on national and international circuits. She first became known as a folk singer in her hometown of Seattle, Washington, and then in 1964 at the Berkeley Folk Music Festival. She eventually toured with folk and blues legends such as Joan Baez, Doc Watson, Mississippi John Hurt, Lightnin’ Hopkins, Albert King, and many others. In 1964, she released her first LP, All The Good Times on Arhoolie Records. As the 60s progressed, Alice shifted to electric rock and blues. In 1966, she collaborated with Frank Zappa as an original member of The Mothers of Invention. She went on to form her own band, Alice Stuart and Snake (some vintage concert footage). Throughout the 1970s, she toured with Van Morrison, Commander Cody, Michael Bloomfield, and John Prine. Alice appeared and recorded with Jerry Garcia, John Hammond, Elvin Bishop, Sonny Terry, Tower of Power, and many others. 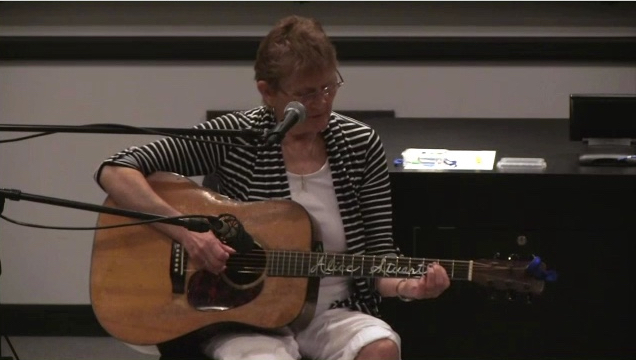 Her songwriting skills led artists such as Irma Thomas, Kate Wolf and Jackie DeShannon to record her music. After spending the 1980s raising a family, Alice returned to music. In 2003, her song “I Ruined Your Life” was chosen for the soundtrack of The Station Agent, a Sundance favorite released by Miramax. As part of his ‘Digitizing Folk Music History’ course and ongoing digital humanities research on the Berkeley Folk Music Festival, Northwestern University’s professor of History and American Studies Michael J. Kramer will present Alice Stuart in a public “conversation and concert.” Admission is free. Funding and support generously provided by the Northwestern University History Department, the Alice Kaplan Institute for the Humanities, Northwestern University Library, Northwestern University Information Technology, and Weinberg College of Arts and Sciences. Alice will perform a solo set at this historic Rogers Park institution. More info at www.heartlandcafe.com. Alice will be be a guest on the Live from the Heartland radio program on WLUW. Tune in 88.7FM for a live performance with Alice and other guests. Stop in for breakfast and listen live or tune in online at www.wluw.org. Alice will play a solo set and then will be joined in a second set by local legend Jimmy Tomasello on guitar and Mike Gallo on bass. Alice hosts a rare country blues workshop. This will be a fingerpicking class with a lot of stress on gaining control of keeping your thumb moving in time. There will be class materials including arrangements of classics by Furry Lewis, Fred McDowell and Skip James. Space is limited and advance registration is recommended. Register at www.oldtownschool.org. Alice will be co-hosting this bi-weekly jam with Ari Mintz. Get there early to sign up to participate. More info at www.vibe1935.com. A resident of Seattle, Alice has been recognized by Seattle Weekly with accolades that include Seattle’s Best Guitarist (2005), Best Band (2004-2006) and by the Washington Blues Society as Best Songwriter (2003-2006). In 2006, she released the first live recording of her now four-decade career, Alice Stuart & The Formerlys Live at the Triple Door. Alice continues to explore her musical roots with the release of her latest recording Freedom which she previewed at the 2007 International Folk Alliance Conference. The CD debuted to a sold out crowd at Seattle’s Triple Door. As one of the top players in the country, Alice was chosen two years in a row to compete at the 2008 International Blues Challenge in Memphis, Tennessee. The event in 2012 marks the 28th year of the annual competition which is held worldwide by The Blues Foundation and is the world’s largest gathering of blues artists. For more information, visit Alice’s website at http://www.alicestuart.com.